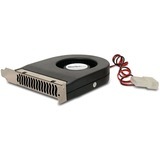 Marketing Information: This high quality PCI Fan is an add-in cooling fan designed to fit in the PCI, ISA or AGP expansion slots of any computer. The PCI fan helps improve expansion card (video card, etc.) performance, by preventing overheating, making it a great video card cooler for older, hot-running 3D graphics cards like the Voodoo, TNT2, GeForce256 and more. Powered through a simple LP4 connection to the computer power supply, the quiet-running PCI Fan utilizes a brushless DC motor that helps maintain expansion card temperatures while creating minimal noise levels. Compact enough to fit into almost any expansion slot such that airflow can be directed as needed most, StarTech.com's PCI Fan is backed by 2-year warranty and free lifetime technical support.